Jeannette D. Fugina (Nee Kezer) Passed away on May 21, 2018, at the age of 98. Beloved wife of the late John R. Fugina, dear Mother of Jean (Michael) Harrass, John Jr. (Pamela), Margaret (Charles) Potts, Marcia (Dennis) Williams, Teresa (Cameron) Harjung, and Michelle Rogan. She is also survived by 13 Grandchildren, 9 Great Grandchildren, other relatives and many friends. She was a Veteran of WWII serving as a Navy Nurse, which is where she met her husband John. They were married for 57 years before John's passing. 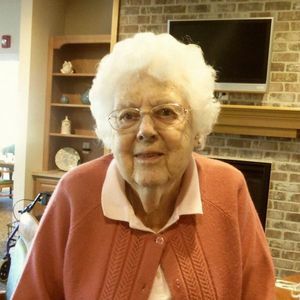 She and John raised their family in Wauwatosa and retired to Avalon Square in Waukesha. She loved to read and was an avid bridge player. She also liked to knit, play backgammon and cribbage. Visitation will be held Saturday June 23 at Wisconsin Memorial Park, 13235 W. Capitol Dr., Brookfield, WI, at 1:00 PM with Memorial Service at 1:30 PM. Interment will follow after the service. Memorials may be made to Avalon Square, 222 Park Place, Waukesha, WI 53186. The beautiful and interactive Eternal Tribute tells Jeannette's life story the way it deserves to be told in words, pictures and video.